I’m showing you Ruth Henshaw Bascom’s work as a celebration of the new show in the Davis Art Gallery, “Drawing: The Art of Making Marks.” Drawing was not really considered a “fine art” medium until the late 1800s. However, there were many artists, particularly women, who explored the many ways of creating finished works of art in the genre. Actually, up until the late 1800s, drawing was considered a “genteel” pastime for women, along with decorating ceramics, needlework, quilting, etc. Long before Winslow Homer and John Singer Sargent established drawing and watercolor as fine art media, Bascom showed just how an accomplished drawing could be a great work of art. Bascom was an apparently self-taught artist born in Leicester, Massachusetts. Her second husband was a minister, and they traveled to many towns in Massachusetts and New Hampshire because of his profession. They eventually settled in Gill, Massachusetts in 1836. The majority of her profile portraits were produced there, depicting family members and neighbors. 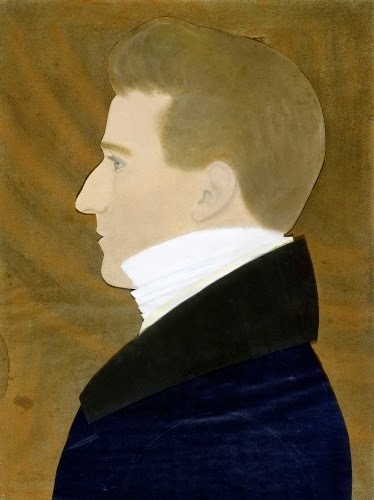 Bascom had begun painting the profile portraits in 1819 at the age of forty-seven. 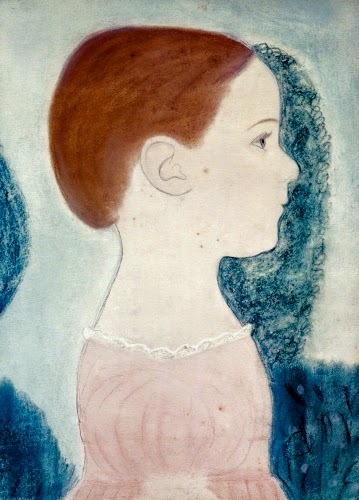 She used the same technique as silhouette artists, where the sitter cast a shadow on a piece of paper and she would trace the outline. She then filled in the details with pastel. She could be considered one of the first collage artists in American art, because she often added cut paper or shiny metallic paper to indicate beads or eyeglasses. In this work, the white ruffle blouse is cut out and pasted on the figure. Sometimes she cut out the face and pasted it over a different background, such as a landscape. In her diaries, now at the American Antiquarian Society in Worcester, Massachusetts, Bascom writes more about her needlework than her drawings. She did, though, once record that she had painted the floor of her house to resemble a carpet. Like many women of the period who were not allowed to attend art classes and usually considered drawing as a “respectable” pastime rather than a career, Bascom never charged for her portraits. Like many well-to-do women of her day, she would have considered it inappropriate to charge for her art. 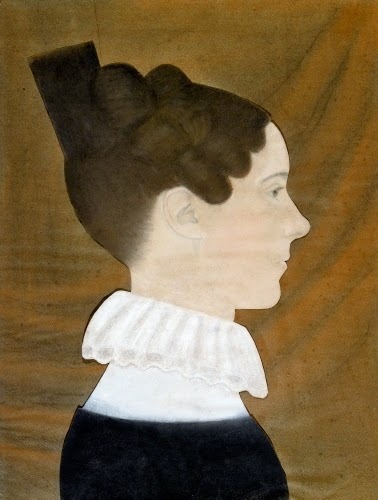 However, her profile portraits are an enduring snapshot of the lives of New Englanders in the early 1800s. They reveal solid compositional skills and a capable handling of realistic form. Studio activity: Create a profile portrait. Project a light on a classmate in profile, and fill in the features and clothing with colored pencil, markers, or watercolor. Create a collage by adding cut out construction paper for details such as clothing, hair, jewelry, etc.